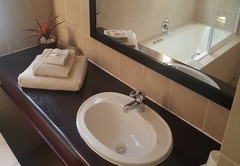 Falling Feather Inn is one of the Brummeria guest houses and provides accommodation in 8 guest rooms for tourists visiting the Pretoria region. 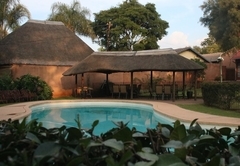 Falling Feather Inn offers lovely bed and breakfast accommodation in Pretoria. 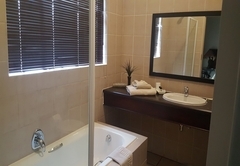 From here you are close to major transport routes and only 40 minutes away from OR Tambo International Airport, making this an ideal spot for both business and leisure guests. From here you are within easy reach of shopping malls, great restaurants, the botanical gardens, golf courses, Attebury Theatre, the CBD and many wonderful attractions and activities to keep you entertained during your stay. Choose from one of our eight luxury rooms furnished with either two single beds or a king size bed and an en-suite bathroom. The rooms are designed for comfort and here you can have a restful sleep. 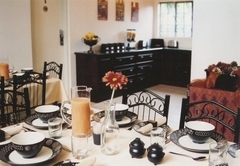 Enjoy a delicious breakfast each morning in our sunny dining room. 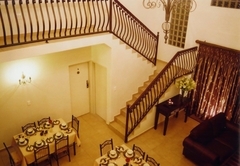 a luxury room with either 2 x Single Beds or a king size bed and an en-suite bathroom. Crisp percale linen. 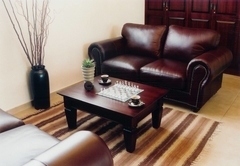 Coffee / Tea tray, satellite TV, Internet Data Connection, Electronic Safe and hair dryer are all available. Response timeFalling Feather Inn typically responds to requests in 5-10 minutes.